After seeing a few YouTubers showcase their iceboxes, I thought it’d be a great idea for a post here. If you love ‘What I Ate Wednesday’ (like me! ), I have a feeling this will also be up your alley! Let me preface this by saying this is a totally accurate account of what can be found in my refrigerator. I literally opened the doors and began snapping pictures, no staging involved. The only manipulation on my part was to turn labels around. Inside the right door, we find condiments galore! Starting from the top, the big bag of Nutiva Hemp Seeds is a constant, as I make my Rich and Creamy Hemp Milk 2-3 times each week. I also add hemp seeds to smoothies for extra protein. We use this quite frequently if we feel we are getting sick or are in need of a boost of energy. I also use it to clean various (non-organic) fruits and vegetables, as well as toothbrushes. Because it’s extremely concentrated, you only use a drop or two at a time, making it a very economical buy! I think I’ve had this bottle for a year or more, and I’ve barely used 1/4 of it. Coconut Aminos – Though often compared to soy sauce, I find coconut aminos to be far sweeter. Though I don’t think of it as a replacement for soy sauce, it has its own appealing taste. Capers – These are delicious in my Simple Cherry Tomato Sauce! They add a nice tang, in a similar fashion to olives. 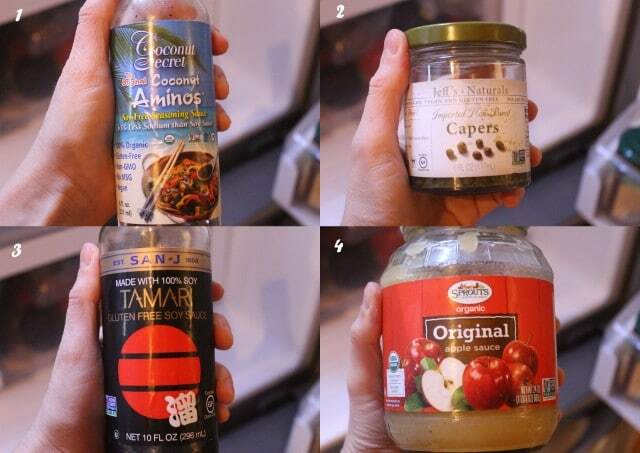 Tamari – A gluten-free soy sauce, I use this frequently in stir-fries, particularly my Better Than Take-out Fried Rice. Unsweetened applesauce – Though homemade applesauce tastes far better than the jarred variety, this is a corner I cut. The cost doesn’t warrant the effort, so I just buy whatever organic kind I come across, so long as there are no added sweeteners. The kids eat this by itself, and I use it in numerous recipes, including these Low-Fat Chocolate Chip Cookies and these Apple Pie-Spiced Muffins. Eden Brown Mustard – This is far and away my FAVORITE mustard. 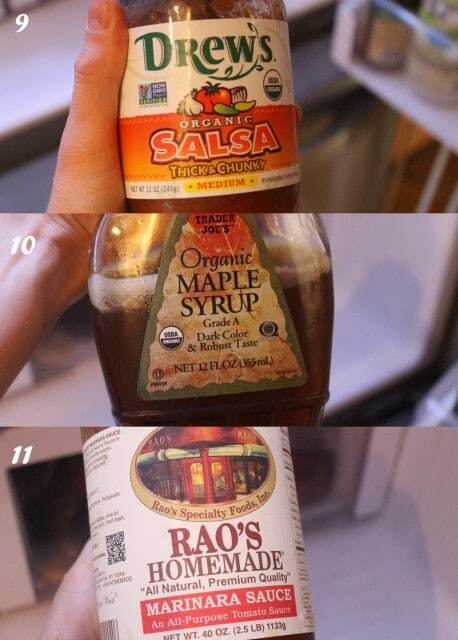 The ingredients list is clean and it adds a nice tang to my favorite salad dressing. 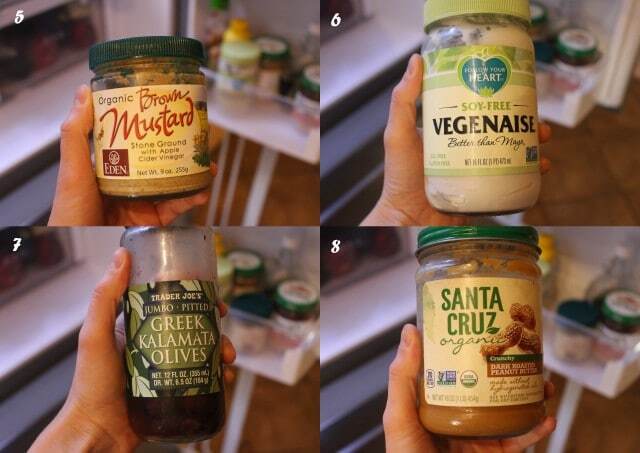 Soy-Free Veganaise – I always have this on hand for sandwiches, particularly this Sardine Melt. Sardines mixed with a spoonful of Vegenaise also make for a great pre-workout snack. Kalamata Olives – These are my favorite kind of olives, and they go great atop casseroles of the Mexican variety. Salsa – The hubs likes to have his chips and salsa on hand, and this brand is one of a few without added sugar. Maple Syrup – I always have a bottle of pure maple syrup for pancakes and various treats, specifically my hubby’s favorite chocolate mint pie. Trader Joe’s has the best deal that I’ve found. Marinara Sauce – I make this from scratch quite often, but in a pinch the bottled works well! I found this jumbo-sized jar of Rao’s at Costco for around seven bucks. In addition to the above, I have a few things prepped for lunches and quick snacks. Sorry for the mess, but this is reality, folks! 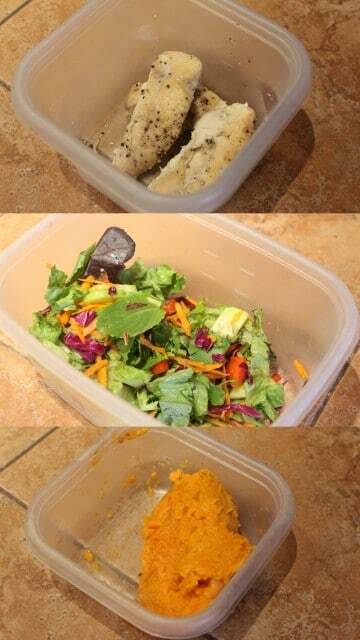 In short, chicken, salad, and sweet potatoes! We throw chicken in everything from salad to stir-fries and casseroles. I usually make a big batch at once and keep it in a Tupperware. I have salad almost every day for lunch, so, again, I make huge salads at one time and keep what I don’t eat in a large container for the remaining week. After recently acquiring a Costco membership, we’ve started buying organic sweet potatoes by the bag! I’ll roast a few at a time and use the flesh for Sweet Potato Brownies or these oatmeal energy bars. Coconut water is something I always have for my morning smoothies. They’re a good source of electrolytes, so it would also be a great post-workout drink. 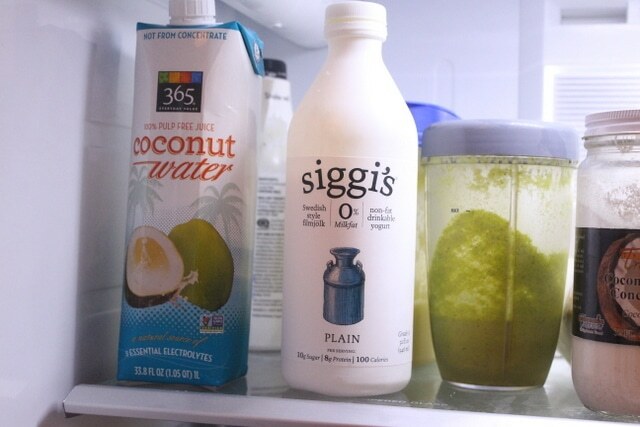 Siggi’s makes a tasty kefir-type drink that I take a sip of every other day or so. I don’t tolerate a lot of it at once, but I find it’s an economical way to get good bacteria into the gut. The two containers to the right are my Zu-Creamy Dressing, which I use for salads, and my Rich and Creamy Hemp Milk, which I use anytime I need a milk. Lots o’ Tupperware! Though I do have glass containers, my plastic ones are old and have off-gassed enough that I’m not super concerned about using them. That’s my rationalization, anyway. The top shelf is filled with containers of half-used onions and peppers, a test run of cilantro lentils (coming soon! ), a container of my Creamy Curried Zucchini Soup, grated parmesan cheese, and Fage Greek yogurt, which I use to make the girls breakfast parfaits. On the bottom shelf, there is a container of various cheeses, including a raw white cheddar and a mild orange cheddar. These are the most tolerated with everyone in our home. 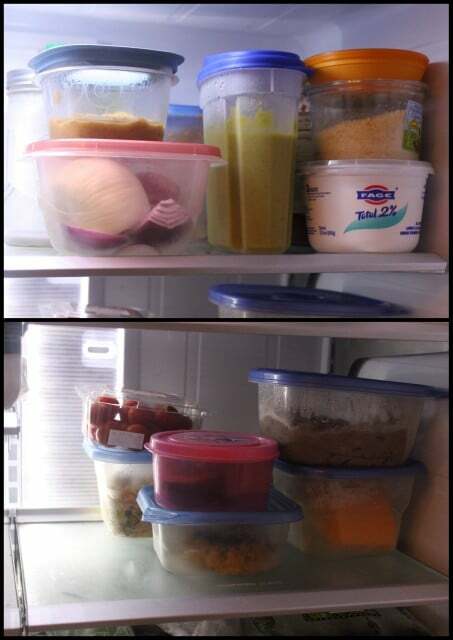 Other containers are filled with random leftovers including chili, chicken and rice, and avocado halves, which I use for smoothies. There’s also a box of cherry tomatoes lurking back there! 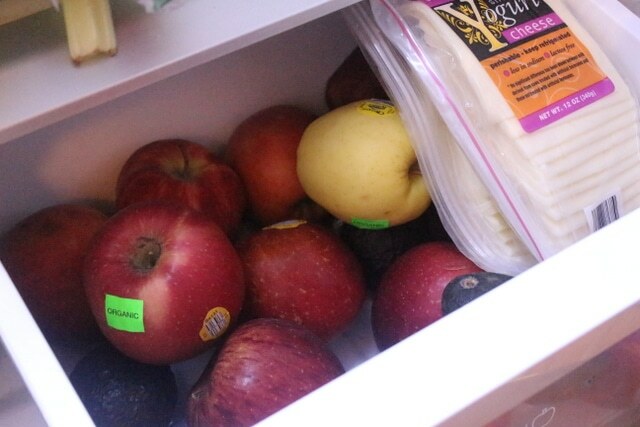 The right drawer is full of apples and more avocados. I like my apples cold! 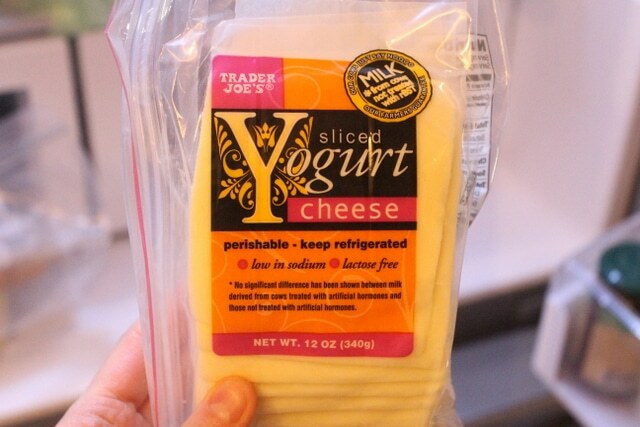 Also in there is my favorite yogurt cheese! I know this cheese is more processed than others, being that it’s sliced and packaged, but it agrees with my allergies very well. 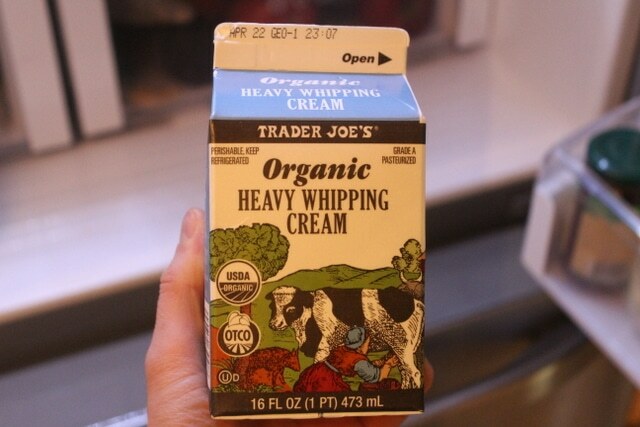 I buy this from Trader Joe’s each week. 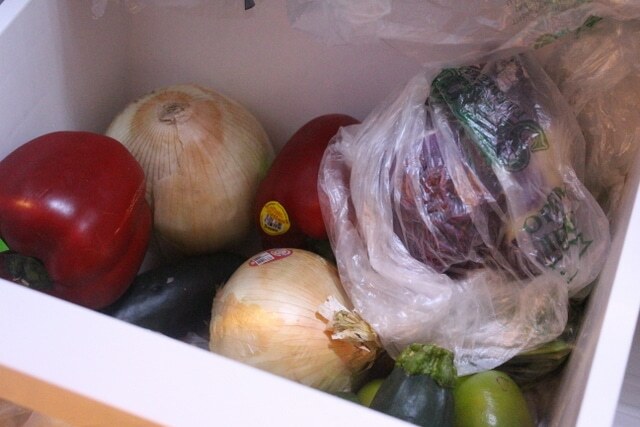 The left crisper drawer is filled with random veggies, including onions, peppers, cucumbers, and zucchini. I spy half a head of red cabbage in there as well! Speaking of cabbage, that shiz keeps for-eva! I love buying a head of cabbage and have it still be usable four weeks later. Along with cabbage, carrots and spinach are also fridge staples. 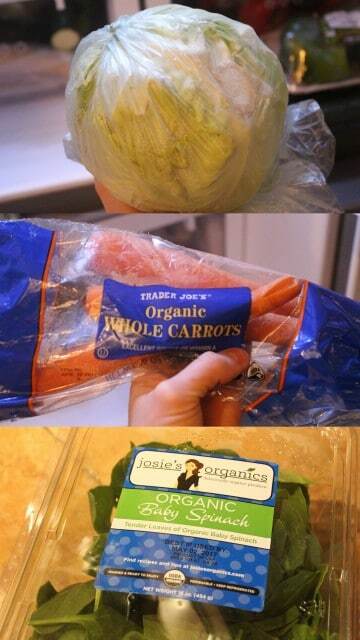 Trader Joe’s has a great deal on organic carrots…79 cents! Lately, I’ve been buying the huge box of spinach from Costco, since I use so much of it. I have a drawer specifically dedicated to nuts and seeds. That’s when you know you’re a health ‘nut’, lol! 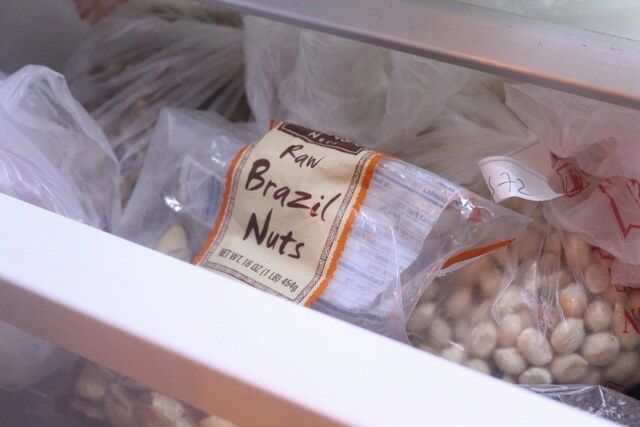 Brazil nuts, raw peanuts, walnuts, and chia seeds abound. For some strange reason, I keep my pumpkin seeds in the cupboard though! 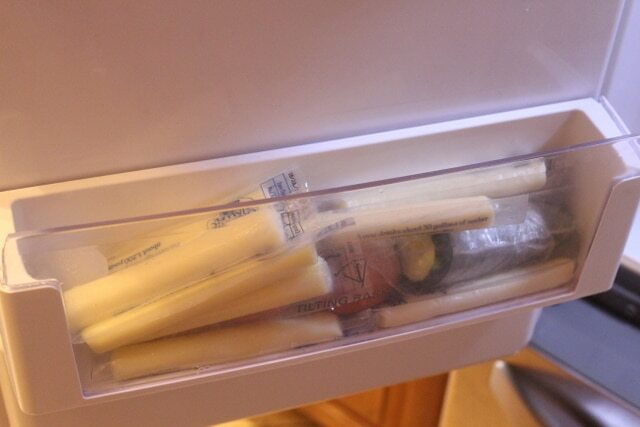 The girls have their own side drawer of string cheese, which we go through fairly quick! I love that this, along with the apples, are snacks that they can grab on their own without my assistance. The girls tolerate this fairly well, so I’ll give them whipped cream with a sprinkle of chocolate chips as a little treat. My youngest daughter even made up a little love rhyme devoted to the white fluff. She says, ‘hello baby, give me some whip cream!’. It’s one of those moments I’ll always remember. The last couple of mentions go to my Homemade Spelt Tortillas and my recent Buckwheat Granola. 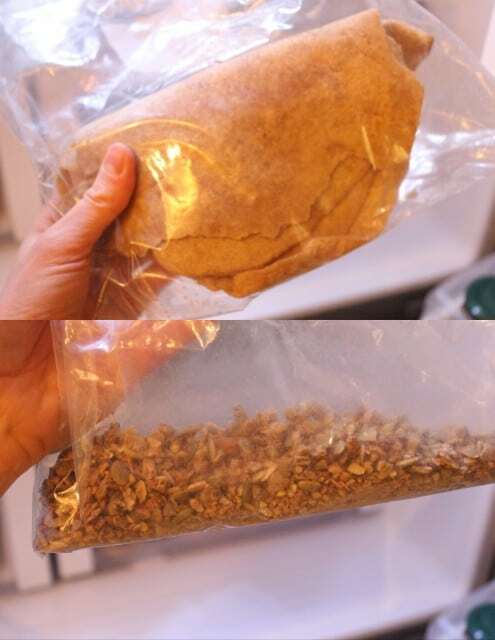 Both are great to have on hand for snacks and lunches. I typically make 1-2 batches of tortillas each week and use them for cheese crisps and vegetable quesadillas. The granola makes a great addition to Greek yogurt and these Gooey Apples. My daughters also like it atop their Vanilla Milkshakes in the morning. Whew! 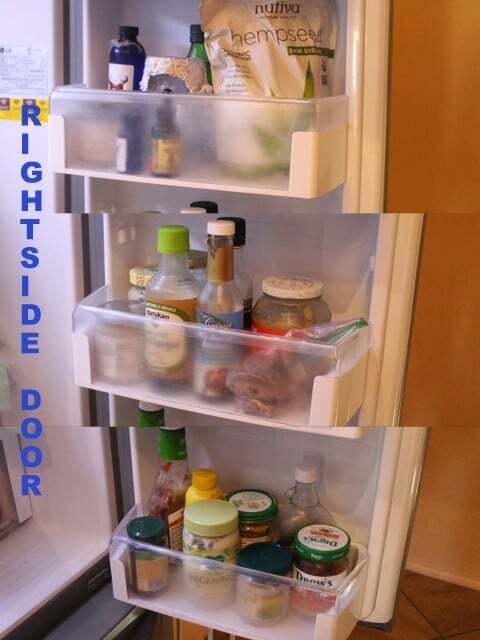 Well, now that you know my fridge intimately, I hope you discovered a few ideas for meals or new products to try out. Let me know in the comments if you have any staples you think I should try! 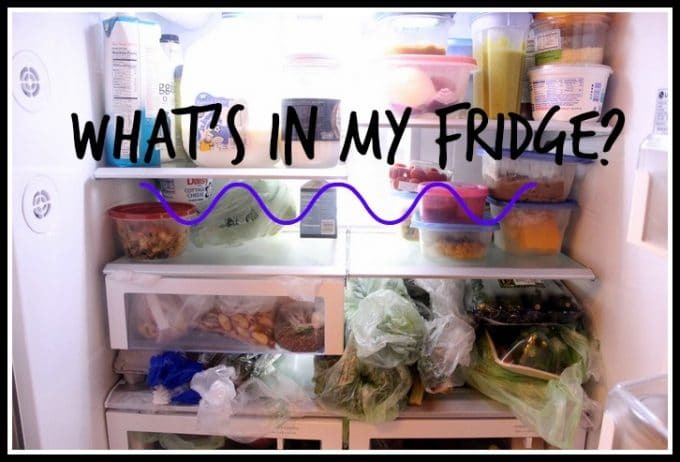 It was so fun to see what is in your fridge! Totally “jelly” of all your TJ products. If only we had one where we live! Have a great week girl! well, you talked me into buying 2 products! 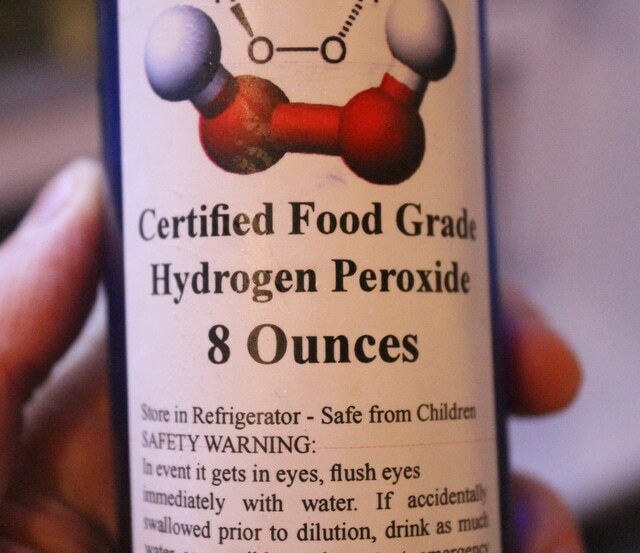 can you tell me more about your usage for the peroxide? i LIKE this post!!! and i hope you’re well!